As I predicted both on the same day!! However it wasn’t all easy sailing as I shall explain. Friday morning arrived & Trinity still wasn’t showing any signs of going into labor. Charlie on the other hand was very restless & just wanted to disappear out the section & down a hole so I knew she was on the way!! I rang & spoke with Tony(my vet) & because she had uterine inertia last time, caused possibly by the over-sized pups there was a strong chance the same thing would happen again. This means she would not push the pups out & also because she got so stretched last time if the pups got stressed it could rupture inside. So the decision had to be made to either do it now (Friday) or risk leaving her till Monday when her milk would be in more & hope she wouldn’t come into labor midnight on Sat with not my vet on call..
Everything went really well with Trinity & Tony had 5 beautiful BIG pups out in no time. They were very slow in coming round & sadly one red girl didn’t. 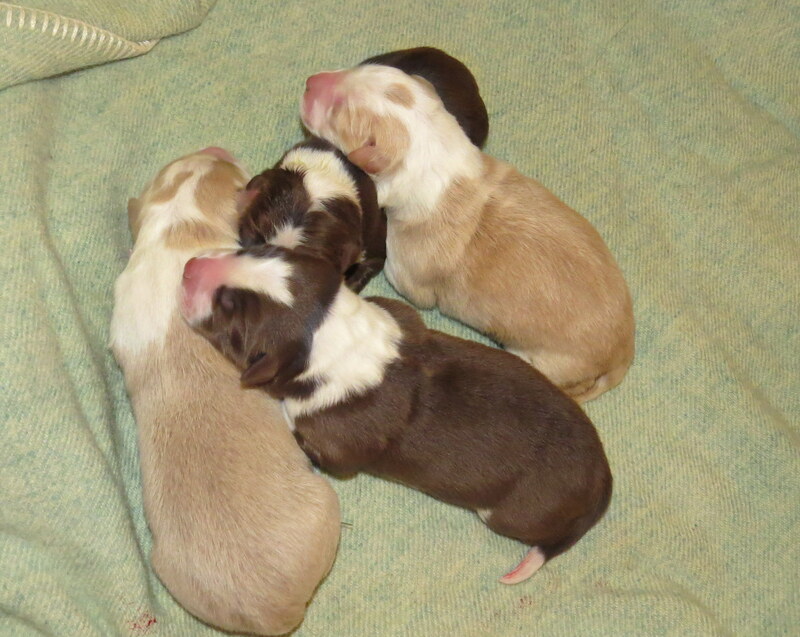 However Trinity & Riley produced 2 healthy chocolate boys, 1 red boy & 1 red girl. All around the 450gms. Tony showed me Trinitys horn & how thin it was so it would have ruptured under stress. 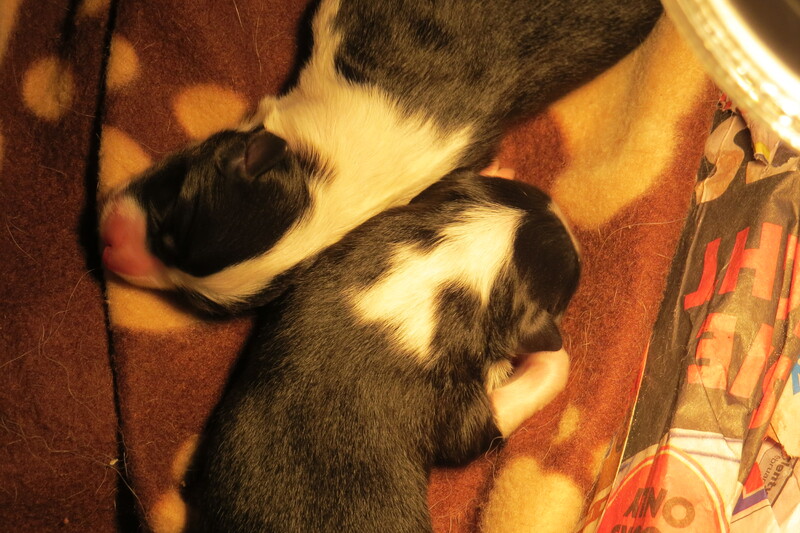 I had Trinity spayed which although is sad to think she wont produce any more pups I’d rather have her then more pups. I got home not long after 5pm & poor Trinity was very sore & unhappy. 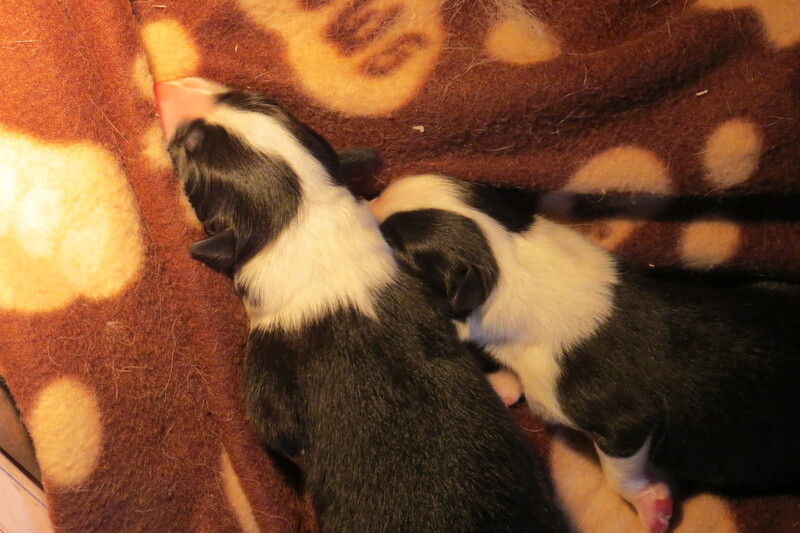 She would lick the pups & let them feed but she would cry so she was feeling sore. 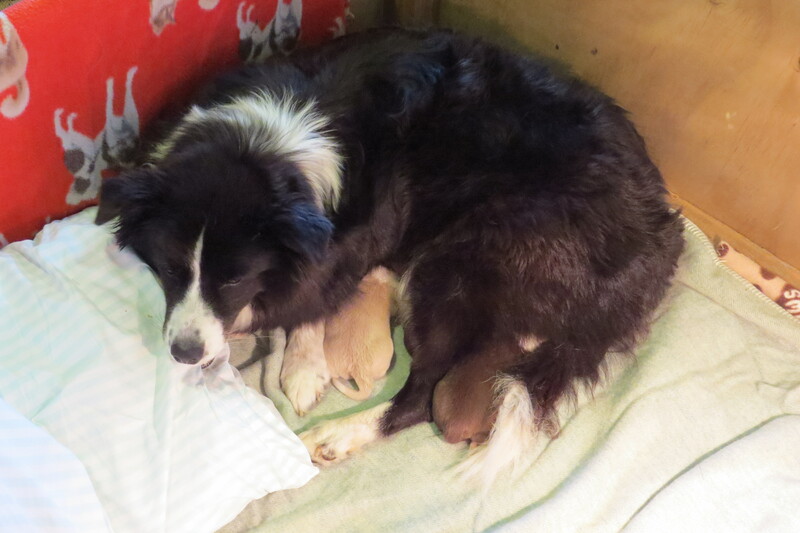 We stayed with her all night & not a peep from the pups so obviously her milk came in which had been my original concern. 9.30pm Charlie popped her first pup out on the couch.. as usual! It looked like a little pip squeak compared to Trinitys monsters!! weighing in at 220gms. 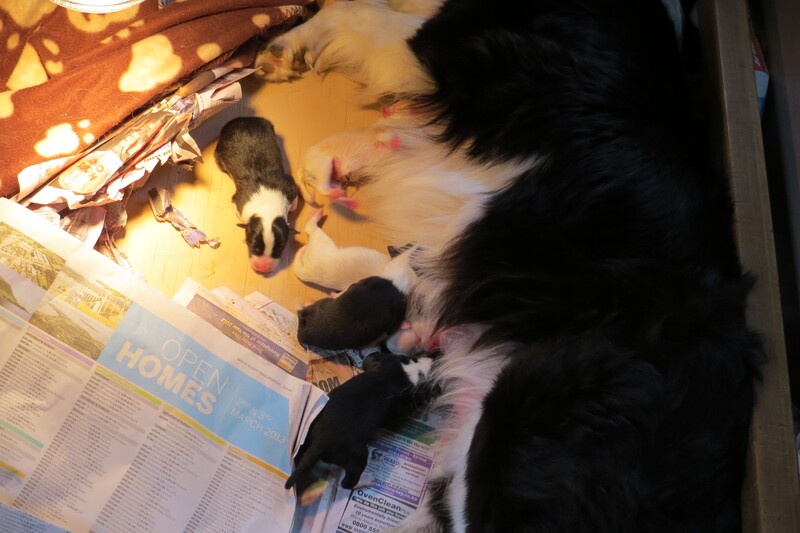 So it was all go here yesterday.. Charlie did very well & by 12am she had had 5 pups.. sadly one black girl died shortly after arriving. She had difficulty breathing so her lungs wouldn’t have been developed . She was still pretty restless so I knew she hadn’t finished. 2.45 no 5 arrived. We have 2 black girls, 1 black boy, 2 red boys. 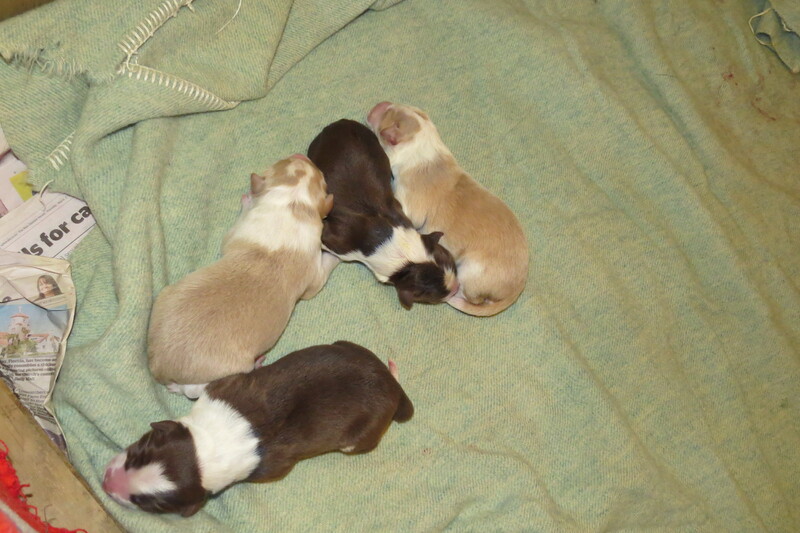 So all up 9 pups & quite a mixture. Mums today are both doing really well. 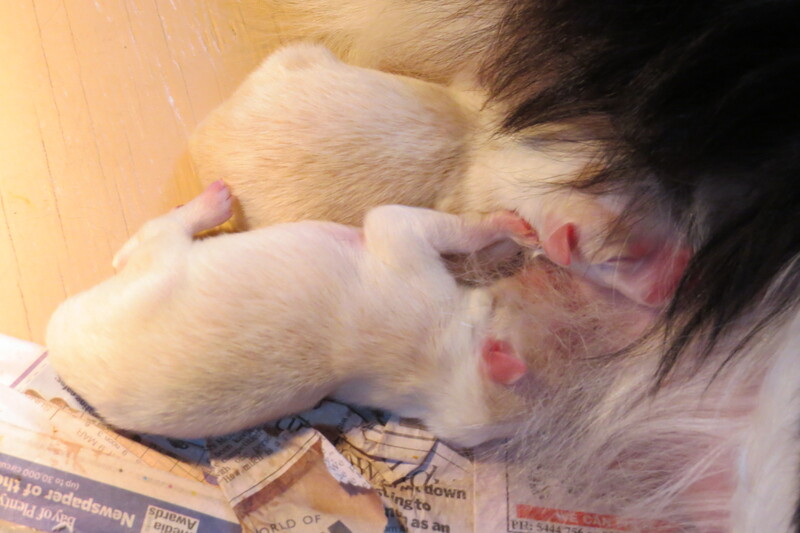 Trinity is more relaxed & being a super Mum again. 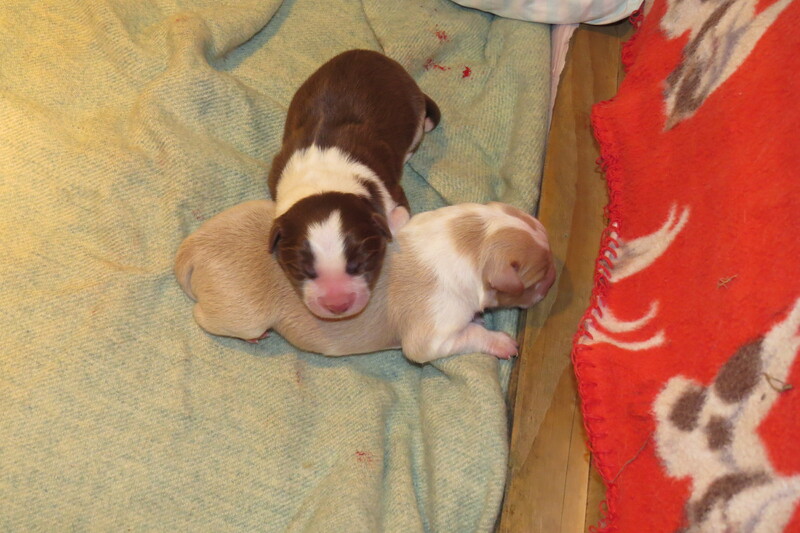 The temperature has dropped so we have got the heating up keeping the pups warm. Mum of the Mums feels pretty exhausted!!!! 5am I crashed on the bed next to Trinity.. not used to these late nights! !